Interstate 375 comprises a short spur extending the Walter P. Chrysler Freeway south from I-75 to the Detroit Riverfront in Downtown Detroit. The six-lane freeway travels below grade between service streets to Jefferson Avenue, where it turns west and transitions into a surface boulevard at Beabien Street. Unsigned Business Spur I-375 overlays Jefferson Avenue 0.167 miles west to Randolph Street by the GM Renaissance Center. Plans to convert I-375 into a surface boulevard resumed and MDOT narrowed the options to two alternatives for a four-lane surface boulevard between Gratiot Avenue and Atwater Street by December 2017.4 The Recommended Preferred Alternative at the December 13, 2018 advisory committee meeting outlines a six to seven lane at-grade boulevard with signalized intersections, bike lanes, a series of crosswalks and a 35 mile per hour design. The interchange at I-75 and I-375 will be reconfigured with new flyovers. A Finding of No Significant Impact (FONSI) for the I-375 Improvement Project is expected by Summer 2019. I-375 curves onto Jefferson Avenue ahead of the GM Renaissance Center in Downtown Detroit. Photo taken 11/06/11. A half diamond interchange adds traffic from Jefferson Avenue west and Larned Street, one half mile south of Interstate 75 (Fisher Freeway). Photo taken 11/06/09. A second entrance ramp merges onto I-375 north from Chrysler Drive at Monroe Street and the Lafeyette Park neighborhood. Two lanes depart next for I-75 southbound and the Fisher Freeway eastern spur to M-3 (Gratiot Avenue). Photo taken 11/06/09. Entering the turbine interchange with the Fisher Freeway, Interstate 375 partitions with three lanes continuing north along the Chrysler Freeway to I-75. Photo taken 11/06/09. Single lane ramps separate for I-75 south toward I-96, the Ambassador Bridge and Toledo, Ohio and the Fisher Freeway east to M-3 (Gratiot Avenue) at the Eastern Market neighborhood. Photo taken 11/06/09. Previous guide signs along Interstate 375 at I-75 included the freeway names. The Elizabeth Street pedestrian overpass here was demolished during construction of adjacent Ford Field. Photo by Dan Garnell (09/13/02). A diagrammatic sign shows the lane allocation for southbound Interstate 75 at I-375 (Exit 51C). I-75 takes the first of three turns in Detroit at Interstate 375, splitting from the Chrysler Freeway for the Fisher Freeway southwest. I-75 turns again at I-96 at the Southwest neighborhood. Photo taken 11/07/09. A diamond interchange (Exit 52) connects I-75 (Chrysler Freeway) with Mack Avenue at the Medical Center and Forest Park neighborhoods a half mile north of Interstate 375. Photo taken 11/07/09. Interstate 375 provides one of two options to Windsor, Ontario via the tolled Detroit Windsor Tunnel from Downtown Detroit. Located three miles to the west, the Ambassador Bridge crosses the Detroit River south from I-75 and I-96 at the West Side Industrial area. The suspension bridge connects directly to Ontario Provincial Route 3. Photo taken 11/07/09. Interstate 75 makes a turn off to stay on (TOTSO) movement at the exchange (Exit 51C) with I-375 and the Fisher Freeway. The Fisher Freeway originates from M-3 (Gratiot Avenue) at the Eastern Market neighborhood nearby. Photo taken 11/07/09. Replaced guide signs with Highway Gothic font for Mack Avenue and the split with Interstate 375 south. Photo taken by Frank Gillon (09/03/07). The Fisher Freeway branches west from M-3 (Gratiot Avenue) at Orleans Street and Eastern Market ahead of the turbine interchange with I-75 and I-375. Photo by Frank Gillon (09/03/07). Heading west below the Market Street pedestrian bridge, Fisher Freeway splits with two lanes continuing onto Interstate 75 southbound to the Corktown and Delray neighborhoods in Detroit. Photo by Frank Gillon (09/03/07). The ramps for I-375 south to Downtown and I-75 north to Hamtramck and Highland Park leave Fisher Freeway westbound beyond the Russell Street overpass. Photo by Frank Gillon (09/03/07). 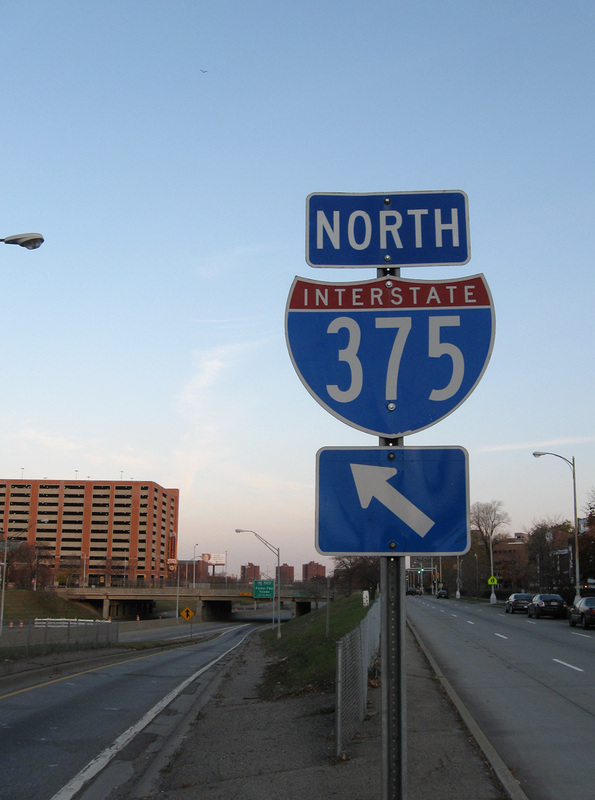 Interstate 375 extends the Chrysler Freeway south to Jefferson Avenue. I-75 follows the freeway northwest to I-696 at the city of Hazel Park. Photo by Frank Gillon (09/03/07). I-75 (Fisher Freeway) runs along the north side of Downtown Detroit from the John C. Lodge Freeway (M-10) to I-375 (Exit 51C). Photo taken 11/06/11. The Fisher Freeway drops below grade as it advances east between the Brush Park neighborhood and Comerica Park (home of the Detroit Tigers MLB franchise) to I-375 (Chrysler Freeway). Photo taken 11/06/11. The Fisher Freeway spurs east to M-3 (Gratiot Avenue) ahead of the McDougall-Hunt neighborhood. I-75 northbound makes a TOTSO movement to overtake the Chrysler Freeway from the ending I-375. Photo taken 11/06/11. Traffic separates with two lanes continuing east to M-3 (Gratiot Avenue) and two lanes for both I-75 north toward Flint and I-375 (Exit 51C) south to Downtown Detroit. Photo taken 11/06/11. Exit 51C separates from I-75 north adjacent to Ford Field (home of the NFL Detroit Lions). Interstate 375 travels below grade from the Fisher Freeway south to Jefferson Avenue at the GM Renaissance Center. Photo taken 11/06/11. Interstate 375 passes between the Greektown and Lafayette Park neighborhoods just north of the Jefferson Avenue east off-ramp to Rivertown. The Chrysler Freeway concludes in one half mile. Photo taken 11/06/11. Two lanes continue beyond the Lafeyette Street overpass for Jefferson Avenue (Business Spur I-375) westbound toward the Detroit Windsor Tunnel and Cobo Center. Photo taken 11/06/11. Interstate 375 south emerges from a series of overpasses on the westerly curve onto Jefferson Avenue at Beaubien Street and the GM Renaissance Center. Photo taken 11/06/11. Business Spur I-375 (Jefferson Avenue) transitions onto Interstate 375 (Walter P. Chrysler Freeway) northbound at St. Antoine Street. Jefferson Avenue extends eastward to Belle Isle and the East Village community. Photo taken 11/06/11. "Decision on I-375 delayed indefinitely." Detroit Free Press, January 25, 2016. Michigan Highways: Business Connections 96 through 496 (Chris Bessert). “Project to dismantle I-375, create new Downtown Detroit boulevard could begin in 2022.” MLive.com, December 6, 2017.